Sheikh Hasina has been sworn in as Bangladesh's prime minister for her second straight term after a election marred by violence and boycotts. Her party won a clear majority, but many seats were not contested by the opposition who demanded a neutral caretaker government to oversee voting. 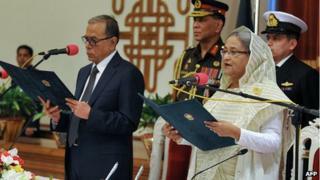 The new cabinet was also sworn in, during a televised ceremony in Dhaka. The international community has called for a re-run of the election amid fears of more unrest. At least 18 people were killed and more than 100 polling stations set on fire on election day, which saw Ms Hasina's Awami League party win a predictable majority. After being sworn in, Ms Hasina, who also led the country from 1996 to 2001, said she would work to uphold democracy. The opposition has vowed to continue their protest and has called for a blockade of roads, rail and waterways to put pressure on the government. The Bangladesh Nationalist Party (BNP) led a nationwide 48-hour strike during the election after its leader Khaleda Zia urged supporters to "completely boycott" what she called a "scandalous farce" of an election. Ms Zia was absent from the swearing-in ceremony at the presidential house, where President Abdul Hamid swore in 29 cabinet ministers and 19 deputies.